Therefore, if any one is in Christ, he is a new creation; the old has passed away, behold, the new has come. 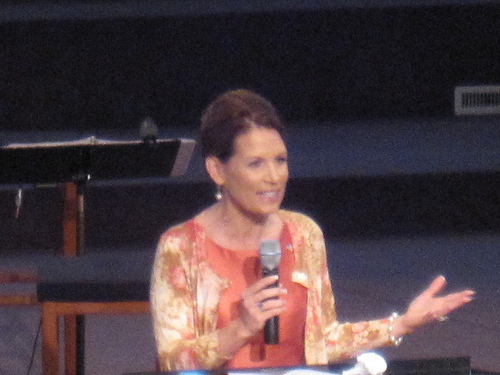 Speaking to more than 500 people at the Des Moines First Assembly of God church, Bachmann shared how she grew up as a Lutheran and lived in Waterloo until the sixth grade, when she was 12. The Minnesota congresswoman talked about how the issue of human life is the “watershed issue of our time” and how she and her husband have been very active in the anti-abortion movement. The couple ultimately had five biological children and during the ensuing years helped raise 23 foster children in their home. I've been closely following the coverage of the Bachmann campaign. The way that the media has attempted to smear her is shameful. The reason that she is so hated by the secular media is that she is a faithful follower of Christ. And don't think that it is just liberal Democrats that are bashing Michele Bachmann; she has been attacked just as viciously by conservative Republicans. She is clearly not the establishment Republican candidate. This indicates to me that she has not sold out to the powerful economic interests that control American politics. Michele speaks of her "fear of the Lord", and placing the Lord above everything else. This is the message of the Bible from Genesis to Revelation. We need a God-fearing President to set things right in America. If we truly lived in a democracy, then Michele Bachmann could easily be elected the next President of the United States. But the way things are, Michele will have to fight her way through this campaign inch-by-inch and day-by-day. "Inheritance" clearly refers to future generations. Similarly, Michele has made a strong appeal to save our children from being buried underneath the debt that the federal government is rapidly accumulating. In the Bible, Judith comes to the rescue of her town which is under attack by the Assyrians. She lures the Assyrian general Holofernes into her tent and then gives him wine to drink until he falls into a drunken stupor. She then uses the general's own sword to cut off his head. "By the hand of a woman" with "the will and the courage to see this through". I just googled her name. Half, if not most, of the search results were links to liberal sites that have and are continuing to bash her. Also distressing are the Christian fundamentalists who say that she "sold out" when she left her church. These are in response to her getting a thumbs up from Bill Donohue. It's sad because if the Christian majority unites then we can reclaim the values this nation was built on. Satan knows he is in a good position right now with the Obama administration and the dominance of secular media. He knows that a candidate like her will put a damper on his agenda. We continue to pray for deliverance from the Evil One. M. I should have mentioned that I was specifically reacting to the "migraine headache" story. I deliberately chose not to mention it, because I didn't want to do more to spread the story. I watched this story develop in real-time. It started with a deplorable hit-piece in the Daily Caller (DC). Never heard of the Dally Caller? Neither had I. The writer of the story was Jonathan Strong. He's a 27 year old who seems to specialize in sensationalized political hit-pieces. The interesting thing is that DC is a conservative news website founded by Tucker Carlson. It seems to be designed to launch smear campaigns against anyone that is outside of the conservative establishment. So liberals and "tea party republicans" are both fair game. Then the mainstream media picks up the story with the excuse that they are just reacting to the DC story. The real story should have been that there is a "dirty tricks" campaign to smear Bachmann. This is similar to the tactics of Nixon against McGovern which eventually led to Watergate. The story then exploded in the press, which negated the fact that Bachmann had just surged in the latest polls. Instead of her gaining in credibility, she is forced to fight for her political life. The timing is no coincidence. The conservative establishment is just as concerned about Bachmann as the liberals are. This gets back to one of my central themes which is that both sides are heavily influenced by secular humanism. This is not as true in the Republican party, but is changing with some Republicans beginning to endorse "homosexual marriage" as in New York. It's funny because Baldwin's argument applies much better to Obama than to Bachmann. In fact Bachmann "has mostly relied on large numbers of small donations to drive her fundraising campaign." I've seen this tactic before where someone is attacked with a fault that is actually an attribute of the attacker. (If you know what I mean.) In order to be successful with this type of attack you would have to dominate the media so that you could drown out a reasonable response from the person being attacked. This is a variant of "the big lie" propaganda technique of the Nazi's. The more preposterous a lie is the more likely people are to believe it -- as long as you are able to repeat it over and over. The very same shocking nature of the lie is what gives it credibility. People think: "They would never say something like that unless it was true." Thanks for the links! It is very revealing that instead of engaging the reforms she wants to implement through proper argumentation, they will nitpick on the smallest thing they can use against her. I pray all this will make her stronger. M. Yes, the attacks against Michele Bachmann are character assassinations and other types of smear tactics. The media is not willing to discuss the issues she brings up. "God’s Law is the Only Law: The Genesis of Michele Bachmann"
"Michele Bachmann’s Very Rough Road Ahead"
So she is very dangerous to the power establishment. I think many within the media expected her to be another Sarah Palin that they could just push around. But so far it seems like she is everything that Palin just pretended to be. She is a "maverick". For the establishment, she is like a loose cannon. They can't control her, so they are deathly afraid of her. Just imagine... a 21st century "populist". Can anything resembling true democracy make a comeback in an America dominated by a massive professional opinion forming industry? I'm referring to the mass media whether liberal or conservative which serves the interests of the powerful few. BTW, if Romney is the Republican candidate, then Obama gets his second term. Perry might defeat Obama, but it would just be a case of shifting the liberal and conservative chairs around. While a Bachmann presidency would be truly revolutionary -- a Christian revolution. Just be warned that any revolution can be painful to live through. And it isn't clear how this evangelical movement would affect Catholics. Although on the core pro-Life issues it certainly seems to be even more Catholic than most Catholics are willing to be.